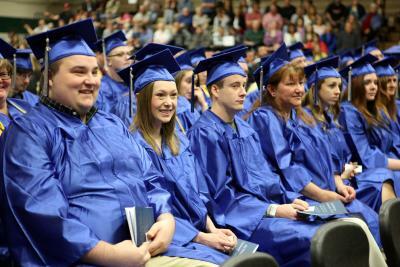 Mid Michigan Community College held two commencement ceremonies May 10 to honor this year’s graduates. In total, 473 students were eligible to receive degrees, and more than 154 graduates attended the ceremonies at Clare High School. MMCC President Carol Churchill spoke at both commencement ceremonies. In the first ceremony for non-health program graduates, Churchill spoke about the need for students to be adaptable and open in their approach to life. During the second ceremony for health career graduates, Churchill and her daughter, Dr. Erica Michiels, Medical Director of Helen DeVos Children’s Hospital Pediatric Emergency Department, spoke about the challenges and rewards facing both the educational and healthcare sectors. Following is the list of Mid Michigan Community College’s 2014 graduates, arranged by their hometowns. Wheeler: John W. Wenzel Jr.